Thippali is a perennial medicinal plant found all over India, having extensive use in indigenous herbal and ayurvedic preparations. It is a vital ingredient of more than 320 classical ayurvedic and herbal preparations. 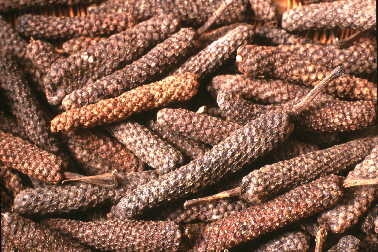 Dried unripe berries or spikes of long pepper are the medicinally important parts. Thippali has its origin in Indo Malay region. 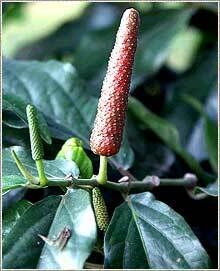 The plant grows wild in tropical rainforest of India, Nepal, Sri Lanka and Philippines. In India it is grown commercially in Assam and West Bengal and also to a smaller extent in Kerala, Karnataka, Tamil Nadu and Uttar Pradesh. However, bulk requirement of thippali is derived from wild growth from Assam, Shillong, West Bengal and also from Indonesia. 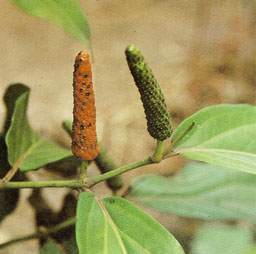 Thippali belongs to the family of black pepper, Piperaceae. The plant is a slender, glabrous, climber or creeping shrub that spreads on ground striking roots at each node. It produces two distinct dimorphic branches – vegetative main branches that creep on ground; and erect growing reproductive axillary branches. The plant flowers through out the year and is dioecious in nature with the male and female flowers produced on different plants. 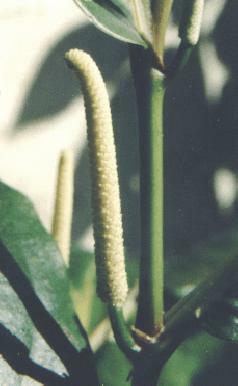 Inflorescence is spike; about 35 millimetres long and 5 millimetres thick, composed of large numbers of minute grayish green or darker grey fruits, which, together with the bracts that support them, are embedded in the elongated axis; and the the whole being covered with greyish dust. Thippali grows well in organic matter rich fertile, well-drained soils. Laterite soils with high organic matter content and moisture holding capacity are also suitable for the cultivation. Optimum elevation for its cultivation is between 100 to 1000 m and higher elevations are not conducive to high yields. Partial shade of 20-25 per cent shade intensity is found to be the optimum. Thippali is propagated by rooted vine cuttings or suckers. Vine cuttings of 3-5 nodes are planted in polybags filled with top soil, farm yard manure and sand in the ratio 1:1:1 during March-April. Normal irrigation may be given on alternate days. Excess moisture in the nursery can cause Phytophthora wilt. To avoid mealy-bug attack on roots, 10 per cent DP of any organo-phosphorus insecticide is to be mixed with the potting mixture. Cuttings will root in two weeks and can be transplanted to the main field after two months. In the first year, regular weeding should be done as and when the weed growth is noticed in beds. Crop irrigated during summer, continues to produce spikes even in the off-season. If grown as pure crop, it is better to irrigate once in a week during summer months and if grown as an intercrop, irrigation to the main crop will be sufficient for thippali also and there is no need to irrigate thippali separately. Care should be taken to avoid water stagnation in beds; and channels are to be laid out to drain excess rain water. Sprinkler irrigation is also beneficial. When the crop is not irrigated, it is necessary to give mulch with dry leaves or straw during summer months. Spray 1% Bordeaux mixture against leaf and vine rot; and necrotic spots and blights on leaves. Any systemic insecticide will control mealy bug attack. If the attack of adults and nymphs of tea mosquito (Helopeltis theivora) is found serious, spray neem seed kernel extract @ 0.25%. For controlling nematodes (Meloidogyne incognita and Radopholus similis) associated with Thippali apply Pseudomonas fluorescens (Pf1) @ 10g/plant is recommended. The vines start bearing spikes six months after planting. Spikes will be ready for harvest after two months since formation of spikes. Fully grown but unripe fruits are to be harvested. Harvesting at correct maturity is important as delay in harvest leads to loss of pungency. The yield of dry spike during the first year is around 400 kg/ha., it increases up to 1000 kg/ha in the third year. After the third year, vines become less productive and should be replanted. Thicker parts of lower stems/roots are also cut and can be used for making Piplamool after drying properly. Harvested spikes are repeatedly exposed in the sun for 4-5 days until they are perfectly dry. The green spike to dry spike ratio is around 10:1.5. Dried spikes have to be stored in moisture proof containers. 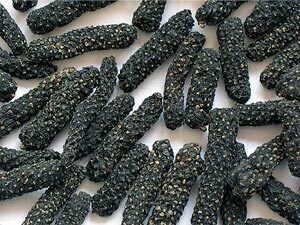 Long pepper of commerce is the dried, unripe spike about 35 mm long and 5 mm thick, brown or blackish in colour. The product has a hot and warm sensoric quality similar to those of black pepper, but not so strong and with slight sweet overtones. The produce fetches price according to the grade. Piplamool, product made of the dried thicker parts of lower stems/roots is of three grades. The grade I with thick roots and underground stem fetching higher price than grade II and III which comprise either roots, stem or broken fragments. The chief constituents of thippali are about six per cent of piperine and one per cent of volatile oil. Other constituents are a pungent resin namely chavicin and starch. Compounds like piper longuminine, cetostearol, methyl piperate and a series of piperine retrofractamides have also been reported. In India, thippali is used mainly in the preparation of pickles and health stimulants like 'chawanprash' and also for imparting flavour and pungency to beverages. But it has well identified medicinal properties. 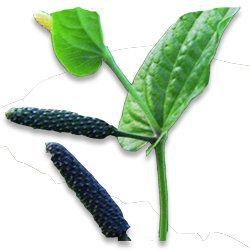 Piper longum is most commonly used as an expectorant to treat respiratory ailments such as asthma, bronchitis, cough, cold etc. and has aphrodisiac, analgesic and carminative properties. In Ayurvedic medicine, the herb is said to be a good rejuvenator and helps improve vitality; and is employed as a tonic to stimulate appetite. It is also being used against stomachache, spleen diseases, tumors, indigestion, epilepsy, flatulence, gout, laryngitis etc. This herb has nerve depressant and antagonistic effects on muscular spasms; and when applied topically, it soothes and relieves muscular pains and inflammation. The oil extracted has antibacterial and antihelminthic properties.